Even though environmental education is basically carried out at schools, out-of-class activities have become increasingly popular. The National Core Curriculum establishes the issues of sustainability and environmentally consciousness as important areas of education. Today mainly science teachers deal with these issues. The efficiency of environmental education can be significantly increased with out-of-class activities (Kalantari et al., 2007; Erdogan and Usak, 2009; Hebel Le et al., 2014). The objective the research presented in this paper was to assess the level of various out-of-class programmes and the frequency of attendance affects the development of the environmental attitude of high school students. 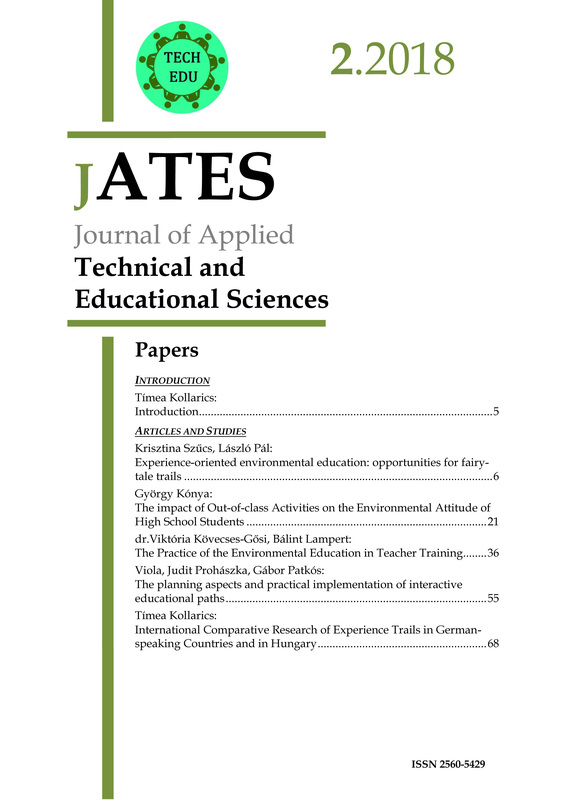 It is the authors’ believe that out-of-class activities focusing on environmental education facilitate the environmentally conscious thinking of students. The method of the survey presented was the questionnaire survey. The questionnaires were filled by 1328 students of four high schools in Miskolc. The results were processed using the SPSS statistical program. High school students who participate actively in out-of-class programmes are more environmentally aware and their emotional attitudes are better for environmental issues.